01:45 Good morning everyone and welcome to AUTOSPORT Live for continuing coverage of round 17 of the 2010 FIA Formula 1 world championship. 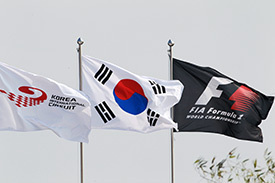 South Korea is the newest addition to the calendar and the all-new 5.615 km circuit at Yeongam is ready for the second day of action. Despite concerns about the state of readiness, the 18-turn circuit held up well in sunny conditions yesterday as the drivers completed two 90-minute practice periods. Having learned the circuit yesterday, the drivers can now go on the attack in a final 60-minute rush as they finalise preparations for the knockout qualifying session this afternoon and the 55-lap Korean Grand Prix tomorrow. Some minor circuit changes have been implemented overnight and we will be detailing those as we build up to the start of the session. 01:46 Today, we will guide you through the final practice session with minute-by-minute commentary as the teams and drivers go through their morning programme of work in preparation for qualifying. Later, at 04:45 GMT, we will return for live coverage of the all-important qualifying session and the battle for pole position. AUTOSPORT Live will end the day with a detailed Sunday weather forecast, on the Korean Grand Prix weather page. 01:47 Following weeks of speculation surrounding the Korean International Circuit - with a late laying of the final asphalt and concerns about the oils in the track compound seeping through to the top surface - the circuit held up well and even began to offer some good grip towards the end of Friday practice. Admittedly, track conditions were terrible as the cars headed out to begin three hours of work on set-up, tyre data and fuel level comparison. Michael Schumacher was one of the first to complete a serious run of laps, but soon it was the Red Bull and McLaren drivers who came to the fore. Lewis Hamilton topped the session for McLaren with a time of 1m40.887s with Robert Kubica again starring for Renault in second, Nico Rosberg third, Sebastian Vettel fourth, Jenson Button fifth and Schumacher rounding out the top six. The drivers continued to lay rubber down in the afternoon and, as they began to push a little harder, an increasing number of mistakes and minor errors were apparent. Sakon Yamamoto was the first driver to cause a red flag at the new venue when he lost control of the HRT as it grounded heavily in the compression at the apex of Turn 16. His car came to rest in the middle of the walled section of track, leaving race director Charlie Whiting with no choice but to halt the session temporarily. When the session is restarted, it was championship leader Mark Webber who rose to the challenge with a great lap of 1m37.942s in the RB6. Fernando Alonso was on good form in the afternoon and he ended the session just 0.190 seconds behind the Australian, with Hamilton third, Kubica fourth, Button fifth and Felipe Massa making it two Ferrari F10s in the top six. 01:49 The weather has changed considerably since the sun shone through and warmed up the track to 35 Celsius yesterday during Friday's second practice session. Heavy cloud cover has drifted in from the East China Sea, and we begin today's action with overcast conditions and cool temperatures. It is expected to remain dry for both sessions today, but there will be little or no sunshine on offer. In the cloudy conditions it will feel cool, with a maximum air temperature of just 19 degrees and there is a slight threat of rain overnight tonight. 01:51 Keep up to speed with our minute-by-minute commentary on the move with the AUTOSPORT app. • Following the traditional Friday driver's meeting, the FIA agreed to make some minor changes at the section leading onto the start-finish straight. The apex kerb at the left-handed Turn 16, where a deep compression had formed, has been filled in with an additional piece of kerbing to help prevent the cars becoming unstable at speed in an area with little run-off area either side. At the final Turn 18 kink, the kerb has also been raised to deter drivers from cutting the apex and throwing vast amounts of dust and earth onto the track surface. • Bruno Senna was sidelined for much of the day after a suspension failure caused him to spear off the track midway through the first session. The Brazilian completed 15 laps in the morning before the problem surfaced and lengthy repairs to both the rear suspension and gearbox meant he only managed one timed lap in the afternoon, putting the team immediately on the back foot. • The trouble continued for HRT as the team was fined $5,000 after an amazing oversight when Yamamoto's car was released with a tyre blanket still attached. • Mark Webber has decided to take his eighth and final new engine at this event. The championship leader will go into qualifying this afternoon with a fresh unit - a ploy he hopes will give him a slight edge in tomorrow's race, while his title rivals are already forced to use older engines. 01:55 There are five minutes to go until the final practice session begins at Yeongam. 01:56 The track temperature is only 22 Celsius under overcast skies. 01:58 Sebastian Vettel is sitting on the tool chest at the back of the Red Bull garage, while his team-mate Mark Webber is all smiles as he looks forward to the second day of action. 01:58 At McLaren, Jenson Button is already in the car and studying data ahead of his first run of the circuit. 0 min: Nick Heidfeld adjusts his helmet to make sure it's sitting comfortably on his head as he gets ready to join the queue of cars. 1 min: Sakon Yamamoto joins the early runners on the circuit. He is followed by Alguersuari, Liuzzi and Buemi. 1 min: Kobayashi in the Sauber leads Trulli in his Lotus around a first installation lap. 2 min: Hamilton and Button are on track in the McLarens. Both will continue using the revised rear wing and will race it this weekend. 2 min: Rosberg, Sutil, Senna and Hulkenberg all join the racetrack as they gather data for the installation run. 4 min: Button and Hamilton have continued over the line into a second installation lap. 4 min: Massa has also been through the pits and resumed for another look at the circuit this morning. 4 min: So far, the bulk of the field is choosing to just complete one installation lap as Barrichello, Schumacher and Webber all come out to check over the condition of their cars. 5 min: Vettel is the only driver yet to join the racetrack, as we watch his team-mate Webber coming down towards the final section where the alterations have been made. 5 min: Webber peels into the pits to bring his installation lap to an end. 6 min: The McLaren and Ferrari drivers wrap up their double installation laps and are back in the garages for the cars to be checked over. 7 min: In the team garages the data download is in progress to ensure that all functions on the cars are working properly. 7 min: The Lotus crew practice a pitstop on the slippery concrete outside the garage before wheeling Kovalainen's car in for service. 7 min: When the data analysts are satisfied that the systems are working satisfactorily, they will give the all clear to the race engineer to begin the morning programme of work. 8 min: There are no cars on track currently, with Sebastian Vettel the only driver yet to complete an installation lap. 10 min: Routine maintenance is being carried out on Webber's Red Bull as he waits for track conditions to improve before heading out for a run. 10 min: Meantime, his team-mate Vettel is now on the circuit and rounds Turn 3 on his installation lap. 11 min: Button tells his McLaren team that the kerbing fix at Turn 16 may not have set properly. 12 min: Vettel guides his Red Bull RB6 back into the pits at the end of a single tour. 13 min: The German lights up the rear wheels as he attempts to lay down some rubber in the pitbox ahead of tomorrow's race. 13 min: The cooler track temperatures this morning may be impacting the track conditions, with drivers commenting on reduced grip levels so far. 15 min: At Williams, Rubens Barrichello is in discussion with Patrick Head as he waits for track conditions to improve before heading out. 15 min: Adrian Sutil has remained in the car as he waits for the go-ahead to continue with the morning programme. 15 min: There has been no support race action on the circuit since F1 practice yesterday, but the ever-present construction dust has had a chance to settle again on the surface overnight. 16 min: Jaime Alguersuari breaks the silence as he launches away from the end of the pitlane and joins the racetrack. 17 min: Alguersuari is immediately weaving his Toro Rosso from side to side to try and generate some tyre temperature. 17 min: The Spaniard will be using the hard tyres for this first serious run of laps. 17 min: Robert Kubica joins the Toro Rosso pair for some early running. 18 min: He is joined on the circuit by team-mate Sebastien Buemi, as Toro Rosso looks to gather data early. 18 min: Lucas di Grassi is also now on circuit in his Virgin Racing car. 18 min: Alguersuari crosses the line to begin the first timed lap of the day ... and he almost out-brakes himself going into Turn 1. 19 min: The grip level is clearly low as Alguersuari fights the STR 5 through the twisty middle section of the circuit. 19 min: Hulkenberg is also on track for Williams as Alguersuari comes round towards the end of the first timed lap. 20 min: Alguersuari posts 1m45.671s to get the ball rolling. 21 min: Buemi is quicker on the circuit than his team-mate Alguersuari, as Force India drivers Sutil and Liuzzi join the fray. 21 min: Buemi loses time in the second and third sectors and slots into second with a lap time of 1m46.410s. 21 min: Di Grassi slots in third quickest with his first effort of 1m52.635s. 22 min: Hulkenberg is taking things easily on his first timed lap. Indeed, the German backs off towards the end of the lap to give himself some clear space. 22 min: Alguersuari lowers the target time to 1m45.248s as his pace improves. 23 min: Buemi jumps above his team-mate with a lap of 1m43.802s as the Toro Rosso show continues. 24 min: As ever in this final practice session, the drivers need to be careful not to prang their cars - particularly through the unforgiving walled section, with limited time to fix the cars before qualifying. 24 min: Adrian Sutil spins wildly exiting Turn 11 and slides sideways across the grass, throwing up an enormous amount of dust. 25 min: Sutil cleverly ended up pointing the right way at the exit of Turn 12 and was able to continue with this run. 25 min: Heidfeld joins the early order in sixth quickest with a 1m47.952s effort. 25 min: Buemi has lowered the benchmark time to 1m42.993s and his team-mate Alguersuari has also improved in second position. 26 min: Sutil is now third on a 1m44.439s with Liuzzi fourth and Hulkenberg fifth. 26 min: Bruno Senna is now on his first timed lap of the day in what is clearly an ill-handling HRT. 27 min: Alguersuari is unhappy with the balance of his car as he continues on this first run. His race engineer tells him to keep pushing. 27 min: Force India is now one and two in the classification, as Liuzzi goes to the front with a 1m42.701s lap. 28 min: Nico Hulkenberg takes over at the front for Williams with a lap of 1m41.449s. 28 min: Buemi retakes the top spot for Toro Rosso after a lap of 1m41.349s as the times continue to tumble. 28 min: Glock is leading the new teams at the moment in seventh quickest but all of the leading contenders are waiting for better track conditions. 28 min: Hulkenberg is now second with a Liuzzi third, Sutil fourth, Alguersuari fifth and Heidfeld in sixth position. 29 min: Alguersuari has come into the pits after expressing his annoyance with the balance of his STR 5. 29 min: Trulli, Kobayashi and Petrov are now on track for a first run. 29 min: Nico Hulkenberg brings his first run of laps to an end. He is in second position after seven laps of the circuit. 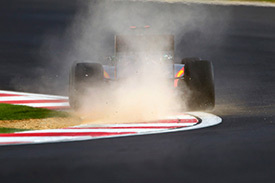 30 min: Kovalainen has been wide at Turn 18, throwing up a big cloud of dust as he clattered over the revised kerb. 30 min: Early pacesetter Buemi is back into the pits as Sutil has his latest lap ruined by Bruno Senna in the final section. 31 min: Alonso and Massa are heading out for a first run on hard tyres. 31 min: Adrian Sutil is fourth in the classification, but would have challenged Buemi's early benchmark had he not stumbled across Senna's HRT. 31 min: The McLaren pair are also rolling out for their first timed run. 32 min: Kobayashi takes fifth with a 1m42.724s lap. 32 min: Mark Webber is the first of the Red Bull drivers to move as he exits the garage and rolls out onto the circuit. 33 min: Rosberg, Schumacher and Vettel are the only three drivers yet to begin a first serious run of laps this morning. 34 min: Alonso finally topples Buemi from the head of the order with his first flying lap of 1m40.795s. 34 min: Webber enters the second sector on his lap out of the pits. The Australian set the pace yesterday with a quick 1m37.942s lap. 34 min: Webber crosses the line to begin his first timed lap of the day, as Vettel rolls out of the pits. 34 min: Massa joins the timesheet in fourth quickest, with Hamilton taking ninth on his first effort. 35 min: Rubens Barrichello slots into eighth position at the completion of his first effort - 1m42.929s. 36 min: Nico Hulkenberg exits the Williams garage as he begins his second run of the day. He is currently third in the classification. 36 min: Mark Webber's first effort places him sixth with a lap of 1m41.598s. 36 min: Button is the fastest man through the first sector, where the McLarens have been strong, on his second flying lap. 37 min: Button takes the top time by a thousandth from Alonso. 37 min: Vettel is now on his first timed lap as the Red Bull show now entertains the crowd. 37 min: Alonso has more in reserve, though, and he improves the benchmark to a 1m39.942s. 37 min: Michael Schumacher leaves the Mercedes garage with less than 23 minutes remaining, leaving him only a short time to run with both types of tyre. 38 min: Webber crosses the line and improves to fourth position with a lap of 1m40.695s. 38 min: Hamilton tops the times with a 1m39.705s despite a sizable bounce over the verge towards the end of his lap. 38 min: Sebastian Vettel completes his first timed lap and slots into 11th position with a time of 1m41.896s. 39 min: Alonso continues his strong run to take back the benchmark with a 1m39.217s. 39 min: Fernando Alonso leads the pack with just over 20 minutes remaining. Hamilton is second with Massa third, Webber fourth and Button in fifth. 39 min: Massa is now third quickest, with Button fifth in his McLaren and Kubica sixth for Renault. 39 min: Mark Webber is up to second position with a lap of 1m39.589s as the order at the front continues to change. 40 min: Vettel completes his second timed lap and posts 1m40.092s to move up to fifth position. 40 min: Lap times continue to improve as Kubica moves up to fourth. 40 min: Button is the next man to head the standings as the world champion clocks a 1m38.939s. 40 min: Schumacher and Rosberg are now on their first timed lap of the day with under 20 minutes to go. 41 min: Hamilton is on a quick lap - fastest through the first two sectors. 41 min: Schumacher slots into 12th position after his opening effort with a time of 1m41.399s. 41 min: Hamilton goes fastest by four tenths from team-mate Button with a lap of 1m38.540s. 42 min: Sebastian Vettel improves his time slightly with a lap of 1m39.780s but the German remains in fifth position. 42 min: Nico Rosberg backed off at the end of his first timed lap due to traffic and remains in 24th for the time being. 43 min: The order continues to shuffle as grip levels improve rapidly. Kubica is now sixth, with Massa seventh and Petrov eighth. 43 min: Mark Webber is up to second position in the Red Bull with a lap of 1m38.777s. 44 min: Michael Schumacher has improved and is now ninth in the Mercedes after a lap of 1m40.281s - that's 1.741 seconds away from Hamilton's benchmark. 44 min: Kubica finds even more pace in his Renault to take second quickest with a 1m38.766s. 44 min: Nico Rosberg is now 11th with a better lap of the 1m40.420s. 45 min: So Hamilton leads the classification with a benchmark time of 1m38.540s ahead of Kubica second, Webber third and Button fourth. 45 min: Down the order in 18th, Glock leads Trulli in the new-teams battle. 46 min: The top five drivers are all back into the pits as Buemi moves up to sixth position in the Toro Rosso with a lap of 1m39.560s. 46 min: Michael Schumacher now takes over sixth from Buemi with a 1m39.340s effort on hard tyres. 47 min: Most of the leading drivers are now back in the pits to take a look at the tyre degradation and graining after the run on hard rubber. 48 min: Replays show the modification to the kerb at Turn 16 is beginning to degrade as drivers continue to clatter over the soft concrete patch. 48 min: Jaime Alguersuari jumped up to fifth position in the Toro Rosso, but has since been demoted to sixth by Rosberg as the German vaulted up the order to second with a lap of 1m38.566s. 49 min: Only Heidfeld remains out on the circuit with just over 10 minutes to go, as the field now contemplates the use of soft tyres. 50 min: Heidfeld improves to 13th as he enjoys having the circuit to himself on hard tyres. 51 min: Kobayashi is now heading out with soft tyres on his Sauber. 51 min: On the HRT team radio, Bruno Senna tells his race engineer that he is experiencing oversteer everywhere on the circuit. 52 min: Rubens Barrichello and Sakon Yamamoto exit the pits to begin their final run of the morning. 52 min: Marshals are now showing the slippery surface flag for the debris from that degrading kerb at Turn 16. 52 min: Kobayashi is now on his first soft tyre flying lap. 52 min: Jaime Alguersuari joins an increasing number of drivers on the track with just over seven minutes remaining. 53 min: Teams may elect to run several laps on the soft tyres in these closing minutes to try and get another read on what looks like high wear. 55 min: Traffic is likely to be heavy for the final five minutes as more cars pile out for soft tyre runs. 55 min: Force India drivers Sutil and Liuzzi join the racetrack. Webber and Rosberg follow them. 55 min: Hamilton has outbraked himself at Turn 3 on his first soft tyre attempt. 55 min: Suddenly we have 23 cars on the circuit with only Hulkenberg remaining in the pits. 56 min: Kobayashi is up to 11th quickest as he takes advantage of the soft tyres. 56 min: Rubens Barrichello improves his time but is down in 13th position with a lap of 1m39.944s. 56 min: Hamilton is on a good lap now with the fastest first sector. 57 min: But it has all gone wrong for Hamilton at Turn 10 as he encounters heavy traffic. He doesn't improve. 57 min: Tonio Liuzzi improves his time but remains in 18th position with a 1m41.591s lap. 57 min: Barrichello is up to eighth position in the Williams after posting 1m39.192s. 58 min: Button takes the fastest time on soft tyres with a 1m38.149s. 58 min: Kubica grabs the benchmark in his Renault - 1m37.932s. 59 min: The drivers are starting to push now and Sebastian Vettel gets very wide at Turn 14 and almost loses control of the Red Bull Renault. 59 min: Alonso has a wild moment in traffic as he is held up by Rosberg's Mercedes. The Spaniard is furious. 59 min: Vettel was lucky to keep control of the RB6 and avoid contact with the retaining barrier. 59 min: Kubica is on course for another major improvement. 60 min: Kubica clocks a 1m37.354s to comfortably top the times as the flag comes out. 03:00 The order is Kubica at the front with Button second, Hamilton third, Rosberg fourth and Webber fifth as we await the final efforts. 03:00 Alonso gets in a clear lap to grab second quickest as the order changes rapidly. 03:00 Webber is up to third on his final attempt with a lap of 1m37.441s. 03:01 Hamilton just falls short on his late attempt with a 1m37.402s, running wide at Turn 17. 03:01 Sebastian Vettel aborted his run after that grassy moment at Turn 14. 03:01 Hulkenberg improved to eighth position on his final lap with a time of 1m38.501s. 03:03 The cars are heading around to make practice starts from the grid. 03:04 Alonso reports his encounter with Rosberg on the radio after almost colliding with the slowing Mercedes a few minutes ago. 03:04 Robert Kubica ends a frantic flurry of laps at the end of the session to top the list with a time of 1m37.354s. 03:04 Hamilton was second and on form again for McLaren with Alonso third, Webber fourth and Rosberg in fifth. 03:05 Massa was sixth in the second Ferrari ahead of Button seventh, Hulkenberg eighth, Schumacher ninth and Sutil rounding out the top 10. 03:06 Vettel was the only championship contender not in the top 10. The German aborted his final run and ended up a lowly 16th. 03:06 The organisers will be looking at the soft concrete patch at Turn 16, but there is little they can do to harden it before qualifying. 03:10 The high octane action in the final five minutes of the session has served as a great taster for what we can expect to see in qualifying this afternoon. The top four were all covered by just 0.087 seconds, and on paper we are set for a dramatic battle for pole position. 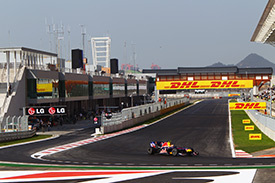 Who will make the best of the track conditions to start the inaugural Korean Grand Prix from the front? Join us at 04:45 GMT for all the qualifying action.